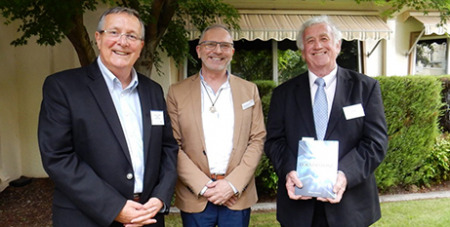 A new book that explores and asserts the centrality of Christ as the cornerstone of the Catholic school has been launched by Australian Catholic University. Source: Catholic Outlook. Associate Professor William Sultmann, deputy dean of Australian Catholic University’s (ACU) La Salle Academy, has published Cornerstone: Encountering the Spirit of Christ in the Catholic School. The book is a scholarly invitation that integrates contemporary educational philosophy, theology and spirituality and has been written for those involved in Catholic school mission and identity, Catholic school leadership, religious education, ministry, evangelisation and formation. Chair of the National Religious Education standing committee Sr Elizabeth Dodds RSC launched the book at a reception hosted by the La Salle Academy for National Religious Education Colloquium participants. “The book asserts and explores the centrality of Christ as the cornerstone of the Catholic school. It is a scholarly invitation into reflection, discussion, integration, collaboration and action for service within the Catholic school, in the Spirit of Christ,” Sr Elizabeth said. Dean of La Salle Academy Professor Br David Hall FMS wrote the forward of Cornerstone, positioning the text as a resource that can support learning with a formation emphasis. “The metaphor of cornerstone invites the response as to how the life and message of the living Spirit of Jesus is mediated through the visible lives of his followers; while the sub-title: ‘Encountering the Spirit of Christ in the Catholic school’ reminds us that it is through the Spirit of Christ that the community of the Catholic school draws its life and imagination,” Professor Hall said.